The start is KEY! It is worth it to push yourself a little more than you are comfortable with to get a good position. Be prepared to be VERY uncomfortable for the first few minutes of every race. 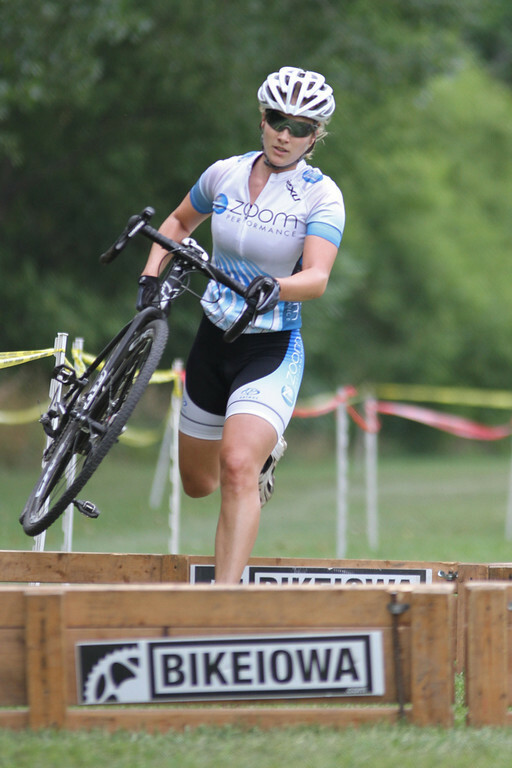 Cyclocross success is all about carrying momentum! When you see something like a steep hill or sand pit, attack it! This will significantly decrease the effort required to get through it (and most likely keep you ON your bike). Similarly, the best line is often the widest line because that means you can carry more speed through the turn. When riding through mud or sand, accept that the bike is going to move some underneath you. Stay relaxed and try to do all of your braking beforehand so that you are not braking (or turning if possible) in the sand/mud. Off camber sections are common on cross courses. Again, do the majority of braking prior to reaching the section to slow yourself down. Then just lightly feather the brakes if necessary while you are riding the off camber. Also do not try to put down too much power or your tires will slide out. Just soft pedal through these sections. Don’t try to be a hero and ride everything. Sometimes it’s faster to run. If possible, make the decision prior to hitting the obstacle so you aren’t caught up in an awkward, unwilling dismount. Don’t underestimate the importance of tire choice and pressure. Learn to refocus. Everyone messes up but you need to be able to learn from it and move on. Get a good warm up before the race and do course recon. Doing at least 1 lap at speed (or at least the technical sections) is a good idea so you know the limits of your tires and what the fastest lines are. Go fast and make up time where you can but focus on being smooth and recovering on sections of the course that you aren’t going to make up significant time anyways. RUN! That’s right, no walking over barriers. RUN! This is an easy way to pick up a few seconds with just a little extra effort. It’s easier to recover once you are on your bike (and potentially coasting while still moving forward) rather than walking and carrying your bike. Cross is a great way to shake up your off-season, so get out and give it a try!